The Atlantic coastline of the United States is a global hotspot for sea level rise, with predicted rates in some areas more than two times higher than the global average. With one of the most heavily developed coastlines in the world, including nearly 12 million people living in its coastal counties and trillions of dollars of property and infrastructure within close proximity to the shore. New York’s low-lying coastal environment makes the region particularly vulnerable to the impacts of sea level rise. Moreover, these vulnerabilities will only be exacerbated in the face of what are expected to be more frequent and more powerful coastal storms, as recent experiences with Superstorm Sandy and Tropical Storm Irene have shown. At the same time, with nearly 2000 miles of marine coastline and a history defined by a relationship with the water, New York offers an abundance of coastal resources – from beaches and dunes, to salt marsh and seagrasses, to native fish and shellfish – and communities of all shapes and sizes that have come to rely on these resources. The decisions that communities and individuals make as they prepare to deal with the impacts of sea level rise will have profound implications for these vital resources. The intersection of all these factors in New York makes having the right tools, information, and resources key to help reduce community vulnerability, plan responsibly, and protect natural resources. The immediate and long-term costs to natural and human communities are increasing as uninformed development continues and natural defenses, such as coastal wetlands and dunes, are lost. Increased flooding from sea level rise and storms affects people and nature in New York, putting at risk both socioeconomic and ecological resources. Losses of homes and wetlands from more frequent and severe flooding, which could become increasingly permanent in some places, are both critical management and livelihood issues. The destruction of private and public property should be of obvious concern. The damage to coastal habitats also represents losses of homes and nursery grounds for many species that are recreationally and commercially important, as well as the capacity to enhance water quality by filtering nutrients and contaminants. Coastal and marine habitats, particularly coral reefs and wetlands, are at the front line of many changes including population growth, natural resource extraction, and sea level rise and are increasingly degraded or destroyed. Loss of coastal habitats also means a reduction in the significant protective value provided for people, including a critical natural defense against storm damage. Human Populations: Nearly 12 million people call New York City, Long Island, and Westchester County home, with a population density that is higher than any state or major metropolitan area in the rest of the United States. With over one million new residents expected to move into the region over the next 25 years, substantial new infrastructure will need to be created to accommodate this increase. Under the dual threats of increasing rates of sea level rise and intensifying coastal development, this coastline is changing at an unprecedented rate, presenting not only environmental challenges but also social and economic ones. In many cases, the significant importance of natural resources such as barrier islands, dunes, shellfish reefs, and tidal wetlands that provide critical habitat, perform essential ecosystem services, and protect human communities from sea level rise and storms impacts are not properly valued and incorporated into climate change planning and adaptation implementation. Infrastructure: A good deal of New York’s coastal private property is only inches above current sea level, which puts billions of dollars in public and private insured assets at great risk. Even moderate sea level rise will result in a significant increase in the likelihood of permanent inundation. More significant rise – with or independent of the occurrence of a catastrophic storm – would be devastatingly expensive and threaten human life. If the 1938 Hurricane were to hit the shores of Long Island today, it would cause an estimated $23.5 billion in property loss and business interruptions. Nevertheless, social and economic factors in both states continue to make building in coastal areas both desirable and legally and economically feasible. Infrastructure at risk from sea level rise and storm surge in New York includes, but is not limited to, commercial, industrial, and residential buildings, roads, railroads, airports, electric power plants, and sewage treatment facilities. The distribution of these types of infrastructure along our coast can be mapped in the Coastal Resilience tool, and impacts to these resources can be determined under various sea level rise and storm surge scenarios, thus identifying current infrastructure at risk. In addition, coastal resilience mapping can help planners envision the placement of new infrastructure in places that are less susceptible to future sea level rise and storm damage. Groundwater is a critical resource on Long Island. The Long Island Aquifer, one of the most productive in the world, provides drinking water for two counties and about 7.7 million people. In addition to this essential ecosystem service to human populations, groundwater aquifers play an important role in maintaining ecological communities. With sea level rise will likely come saltwater intrusion into groundwater aquifers, which will have impacts on both their ecological function and their ability to provide drinking water. As sea level rises and intrudes into groundwater stores near the coast, some drinking water will no longer be potable. The salinity of freshwater aquifers near the coast will gradually increase as seawater flows toward them underground and seeps in through pore spaces in the soils or rock fractures. Water Quality: With rising seas, the water table will increase in elevation and saltwater will rise in the aquifer. Along the coast, ground water elevations are expected to rise at about the same rate as sea level. Sewers, drainage systems, and other critical infrastructure have been designed with the normal annual fluctuations of the water table in mind. A progressively elevated groundwater table will interfere with these systems, causing malfunctions and damages, and incurring major expenses for municipalities and the state. One of the largest impacts of a rising groundwater level is an increase in the number of cesspools and septic systems in coastal communities that are either intermittently or continuously submerged. This has serious implications for water quality both for the groundwater and in our coastal bays and estuaries. Additionally, an elevated groundwater table will mean increased frequency of basement flooding events, a common complaint among coastal residents on the south shore of Long Island. Inundated septic systems and failing sewage treatment facilities will result in excessive nitrogen entering groundwater and, eventually, coastal surface waters. This will have the double impact of impacting drinking water as well as degrading the health of vital coastal habitats, such as tidal marshes. High levels of reactive nitrogen in surface waters have been linked to the collapse of tidal marshes, reducing the suite of benefits they are able to provide to people in neighboring coastal communities and drastically diminishing the overall health and function of the coastal system. Tidal Marshes: Among the most productive ecosystems on earth, tidal wetlands perform many functions that are highly valued by society, called “ecosystem services.” Wetlands protect coastal water quality by filtering land-derived nutrients and contaminants; they are an important component of the coastal food web; they provide valuable wildlife habitat; and they protect upland and shoreline areas from flooding and erosion associated with storms. In sum, wetlands support the health of our coastal ecosystem and the recreational and economic activities that depend on it. As the sea rises, wetlands must grow – both vertically and horizontally – or risk being drowned in place. In order to grow vertically, a wetland accumulates sediment on its surface and bulks itself up from below by producing a dense mat of roots and rhizomes below ground. If this rate of accretion is greater than the combined effects of sea level rise and subsurface compaction, the marsh keeps its head above water. In New York, some marshes are apparently keeping pace with sea level rise; however, many more seem to be falling short. When the vertical growth rate of marshes falls below the rate of sea level rise, marshes become waterlogged, the species of vegetation shift to those more tolerant of anoxic waterlogged soils and the marsh eventually converts to un-vegetated mudflat. Conversion of high marsh to low marsh will eliminate the habitat functions for nesting birds as well as other fauna that use the high marsh for breeding and foraging. Conversion of vegetated marsh to mud flat or open water will result in the loss of all functions and values for plants and animals of tidal wetlands. Because the rate of sea level rise is accelerating, marshes will have to accrete sediment even faster to keep up. Additionally, any reduction in the amount of sediment available for accretion (because of natural or man-made impacts) increases the risk of submergence. Elevated nutrient enrichment also negatively influences the growth of marsh roots and rhizomes belowground and increases peat respiration rates, compromising marshes’ ability to grow vertically. In order to grow horizontally, wetlands require adjacent space into which to migrate that is not obstructed by development. New York’s tidal wetlands themselves are well protected by federal, state, and local law in the places where they exist today; however the areas adjacent to many of these wetlands are already developed and unavailable for marsh migration. Without additional protection for these adjacent areas in recognition of the fact that these properties are the advancement zones into which wetlands need to migrate in order to persist, property owners might fortify their property as sea level rises to prevent inundation of their property. By creating obstacles to marsh migration, those actions prevent the marshes from persisting into the future. Despite existing regulatory protection, it is clear that salt marshes are already losing acreage, and shifting from high marsh species to low marsh species, probably due to a combination of factors including sea level rise. Salt marshes in New York City’s Jamaica Bay are one frequently-cited example of marshes undergoing rapid conversion from vegetated wetland to mudflats, with sea level rise identified as one of several contributing factors. Accelerating sea level rise will only exacerbate these losses, and we will lose the associated ecosystem services these important areas provide. The distribution of tidal marshes throughout the full geography can be mapped on a base layer included in the mapping tool on this site. Also for a limited extent of the geography (Long Island Sound shorelines), likely marsh advancement zones can be displayed. Barrier Islands: The barrier islands that fringe Long Island’s south shore provide protection from storms and storm surge for the human communities along the mainland coast, but they also serve as unique habitats for many species. Fire Island provides critical habitat for several rare and endangered species, and serves as a migratory corridor for birds, sea turtles, and marine mammals. Fire Island also encompasses vital coastal wetlands essential to water quality, fisheries, and the biological diversity of coastal, nearshore, and terrestrial environments. The health of the barrier island complex is fundamental to the health of the bay system overall. The barrier island provides not only the physical boundary of the bay, but also undergoes a variety of geophysical processes that control aspects of water quality in the bay through impacts on the rate at which oceanic water is exchanged with bay water. The natural processes of cross island and long shore sediment movement, particularly the event-driven movements that occur during storm events, are responsible for the natural creation and modification of beaches, dunes, and flood tide deltas which are productive feeding grounds for shorebirds such as the piping plover and ultimately become colonized by marsh plants and submerged rooted vascular plants (SRV). Although there is a diversity of views on the likely impacts of sea level rise on barrier islands, and the effects are likely to vary substantially from site to site, some generalizations can be made. Accelerated sea level rise will tend to exacerbate barrier island erosion problems, thereby further diminishing the habitat values of barrier islands. At low to moderate rates of sea level rise, the effects will be less than those from storm events and disruptions of the long shore sediment transport in those areas experiencing the most severe erosion problems over the next 30 to 50 years. At higher rates of sea level rise, barrier islands may experience increased erosion, overwashing, and possible breaching in areas with limited sediment volumes. At the highest projected rates of sea level rise, overwashing and breaching would continue to increase, either creating the platforms onto which the barrier islands “roll-over” or migrate, or exposing the bay and mainland shoreline to more oceanic conditions. Piping Plovers: A suite of beach-dependent species relies on the dynamic nature of beaches, and in particular on the dynamic nature of barrier island beaches. One of these species is the beach-nesting piping plover. The piping plover is a small North American shorebird which breeds on coastal beaches from Newfoundland to North Carolina, wintering along the Atlantic Coast from North Carolina south, along the Gulf coast, and in the Caribbean. The Atlantic Coast piping plover population is designated as threatened under the federal Endangered Species Act, and is considered endangered under New York State Environmental Conservation Law. Piping plovers also receive protected status under the federal Migratory Bird Treaty Act, as well as several local ordinances. Sea level rise puts this endangered species at risk by threatening its primary habitat, barrier island beaches, as well as the other natural coastal beaches where they nest. Human responses to sea level rise such as shoreline armoring may exacerbate the impacts to this species by further reducing available nesting habitat and connectivity with foraging habitat. As a ground-nesting species, piping plovers require minimal disturbance and nesting habitat of sufficient width to be reproductively successful. Piping plover nesting activity occurs above the high tide line on coastal beaches, sandflats at the end of sand spits and barrier islands, gently sloping foredunes, blowout areas behind primary dunes, and washover areas. Nesting usually occurs in early successional habitat consisting of wide, open, sparsely vegetated sandy beach. Sea level rise has the potential to reduce available nesting habitat between the high tide line and the vegetated dune and result in increased incidence of nests being washed out. In addition, beach stabilization projects such as beach nourishment and dune building reduce connectivity between nesting and foraging habitat because they tend to increase vegetation encroachment, which often creates a barrier to bayside access for chicks. Suitable breeding habitat for the piping plover can be mapped for the south shore of Suffolk County’s barrier island system in the mapping tool. Seagrass beds, also known as submerged rooted vascular plants or SRV, serve as shelter and nursery grounds for hundreds of species, including juvenile and adult fish, shellfish, waterfowl, sea turtles, and invertebrates. The plants can contribute significantly to the overall primary productivity of an estuary, and energy present in seagrass enters the estuarine food web as detritus. Seagrass provides structure for benthic (seabed) communities and can slow down currents, thereby decreasing erosion. 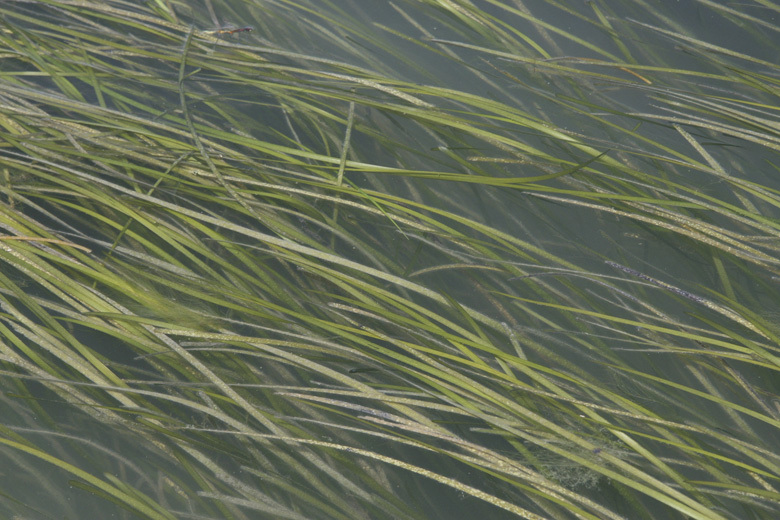 Seagrasses also contribute greatly to the nutrient and carbon cycling in estuaries by taking up and storing significant amounts of carbon and nitrogen in their tissues and roots. Global climate change and increasing nutrient loads from septic systems are likely to have drastic and irreversible effects on seagrass beds. Elevated temperatures will cause prolonged temperature spikes that are believed to lead to large-scale die-offs and to hamper restoration efforts. The Coastal Resilience project provides support for action on the ground through a nationwide analysis of policy approaches that have been implemented in other locales and recommendations for adaptation that jointly address losses to human and natural communities. At the heart of municipal, state, and regional planning is the intent and requirement to implement solutions that will help a given community by ultimately improving the quality of life for residents, the economy, and the environment. At its best, planning provides a proactive process that incorporates all credible information and stakeholders to guide decisions that enable a future vision for a community. One of the critical issues we face today is the projected impacts to our coastal communities from climatic changes that are underway. In the aftermath of Superstorm Sandy, New York Governor Andrew Cuomo said that “there are some parcels that Mother Nature owns” during his announcement of the creation of a Sandy recovery program to offer buy-outs to home owners in some of the most vulnerable coastal areas in New York. Parcels that were acquired through this program, entitled New York Rising, were to be returned to a natural state, restoring coastal floodplains and reducing the number of people and infrastructure located in highly vulnerable areas. Given the low lying nature of some coastal communities and the increased risk of regular flooding, programs that offer voluntary acquisition offer homeowners an opportunity to get out of harms way while also creating space for the restoration of more natural coastal processes and coastal floodplains. Though such programs are often easiest to implement in the aftermath of a disaster, updates to the Community Preservation Fund legislation, a five town property transfer tax mechanism that funds property acquisition on the east end of Long Island, has created the opportunity to use these funds to acquire vulnerable coastal properties outside of a disaster situation. A comprehensive or master plan contains the blueprint for the future development, preservation and sometimes the resilience of a community. Many states authorize local legislatures to prepare and amend specific municipal comprehensive plans in accordance with the general state goals. A good comprehensive plan guides the physical and economic development of the community and is flexible enough to accommodate social, environmental, and regional concerns such as climate change. Comprehensive plans are not law, however the statutes that require their preparation mandate that all zoning and other land use laws must be adopted in accordance with the plan. This prevents the enactment of arbitrary regulation and ensures the public welfare is being served through legislation implementing the goals of the community. The town also participates in a program with four other Long Island municipalities, implementing an additional 2% tax on houses over a certain price. This extra influx of tax money has allowed increased spending on wetland conservation and sea level rise mitigation. Preservation with Regional Plans: Historically, land use control in the United States has been local; states delegate planning power to local governments in conjunction with the power to implement those plans. However, this localization of land use control has often hindered logical, comprehensive planning at a regional level. Today, local governments are authorized, by state constitution or by statute, to voluntarily cooperate to accomplish a number of local municipal responsibilities including planning. One of the advantages of adopting a regional land use plan is uniformity and coordination. However, a significant disadvantage is that regional plans tend to divest authority from local governments most familiar with the unique geography, history, and social constraints of an area. Therefore, when instituting regional planning commissions and subsequent planning documents, municipal authorities must strive to realize a broad coordinated effort while still retaining and relying on the invaluable input of local knowledge, especially as complicated challenges of climate change adaptation develop over the next century. Under the Plan, the County Executive convened the Global Warming Task Force (Task Force), drawn from public officials, subject experts, educators, and business leaders in the county. The Task Force considered the 2005 countywide GHG footprint and the most recent climate science to set a goal of 20% reduction in GHGs below the 2005 base year by 2015. The Task Force set a goal of 80% reduction by 2050. To achieve these reductions, adapt to climate change, and promote sustainability, the Task Force identified countywide strategies for energy, transportation, land use, water resources, and waste and green purchasing. The actions developed by Task Force members, in conjunction with outside experts, to address climate change and sustainable development approaches were evaluated by sectors within the County to identify those that were appropriate and feasible for each. The plan organizes the strategies by sector and provides a recommended time frame for completion ranging from short term (1 to 3 years), to medium term (3 to 8 years) to long term (8+years). In December 2006, the New York City Office of the Mayor implemented PlaNYC, a strategic plan that includes a blueprint for citywide climate change adaptation. The City’s strategy focuses on controlling and reducing greenhouse gas emissions but also includes plans to fortify areas vulnerable to storm surges and flooding. The City’s process relies on detailed reports prepared by the Goddard Institute for Space Studies concerning the potential impacts of accelerated sea level rise on New York City. Shoreline planning, like comprehensive planning, is a method of coordinating goals and objectives to establish a route for the immediate and long range protection, enhancement, and development of sensitive shoreline communities and ecosystems. Shoreline management plans are implemented under various legal auspices. The Federal Coastal Zone Management Act (CZMA) establishes a process for the development of state coastal zone management programs and offers cooperating states federally funded development and administrative grants. States that develop plans or programs under the CZMA benefit from a federal consistency requirement, meaning that any federal agency proposing to conduct, permit, or fund a project in an area that has an approved plan must act consistently with the provisions of the plan. State statutes implementing the federal CZMA may either require or allow local governments to create plans to manage, sustain, or revitalize local shorefront. Local governments may voluntarily adopt shoreline management plans or local waterfront revitalization plans (LWRPs) under the authorization of the state plan that are specifically designed to meet local needs. A state plan might also require the adoption of LWRPs rather than allow their voluntary implementation, while still permitting the program design to reflect local needs. The federal consistency requirement applies to these locally adopted plans. The Town of Easthampton enacted a harbor overlay district under its LWRP. The district established additional standards to reduce adverse water quality impacts emanating from the all permitted uses on parcels that are adjacent to the shore. Additionally, Easthampton integrated the coastal management component of its LWRP directly into the comprehensive plan prepared for the area. Special area ordinances may be adopted to protect sensitive resources facing development pressures or hazards from threats including sea level rise. Regulations governing such areas may require that proposed development undergo scrutinized environmental impact assessment; may prohibit uses other than non-intensive recreational ones; or may divide land within the critical area into classifications supporting development, limited development, and strict resource conservation. The Town of Brookhaven implements critical environmental area designations along with SEQRA review procedures in a separate chapter of the town code. Recognizing the value of the town’s “vast and precious natural and human environmental resources” and acknowledging intense development pressures, the town designates critical environmental areas and adopts lists of actions subject to environmental review. Actions requiring environmental impact statements include actions affecting certain agricultural areas, critical environmental areas, or open space, historic, or landmark resources. The Code designates the Brookhaven Coastal Zone Area as a Critical Environmental Area. As such, any proposed use or development in that area is considered a Type I action under SEQRA, so it has to meet the requirements of preparation and submission of a long environmental assessment form (LEAF). This submission would necessitate an examination of future sea level rise hazards. Where authorized by state law to do so, localities can provide for the transfer of the right to develop property under current zoning provisions from one part of a community or region to another. Voluntary, market-based transfer of development rights (TDR) programs offer protection for sensitive coastal resources and hazard areas by directing needed development away from the resource, designated the “sending” area, and siting it in an appropriate “receiving” area, where increased density of development can be accommodated. In eastern Long Island, New York, a TDR program was created to protect the Central Pine Barrens, an environmentally fragile and resource-rich area encompassing over 100,000 acres. Faced by requests for over 220 development projects in the area and stymied by time-consuming and costly litigation over their environmental impacts, the towns, landowners, developers, citizens, and environmentalists joined together to develop a plan, including the use of TDR, to preserve a core area of about 55,000 acres. The Long Island Pine Barrens TDR program was modeled after the New Jersey Pine Barrens program. It was established under state legislation adopted in 1993 and is implemented under a comprehensive land use plan adopted in April of 1995. Several municipalities with jurisdiction over the Pine Barrens area are involved in the program. The comprehensive plan allocates Pine Barrens credits to land in designated sending districts based on their development yield. Under the zoning law, land in the sending district may not be developed. Instead, that applicable zoning is used to determine the development rights that may be transferred. The development yield varies according to the number of units the zoning law permits per acre. If zoning permits four units per acre, the development yield factor established is 2.7, yielding that number of credits. Pursuant to its authority under the Clean Water Act, the EPA has established a two-phase Stormwater Management Program. Phase I began regulating medium and large operators of municipal separate storm sewer systems (MS4s) in 1990. The Phase II regulations, which were issued in 1999, apply to local governments that operate storm sewer systems that discharge to federally protected waters. Phase II regulates small MS4s as well as small construction activities; i.e., those activities disturbing between one and five acres of land. Operators of regulated MS4s are required to obtain either an individual or general National Pollutant Discharge Elimination System (NPDES) permit. Nassau County’s storm water management program (NCSWMP) includes a list of Best Management Practices (BMPs) implemented by the County and a coalition of local municipalities to achieve the regulatory standard of reducing pollutants in the County’s stormwater to the maximum extent practicable. The County Department of Public Works, with input from local “Task Groups,” developed the BMP’s, measurable goals, implementation schedule and initial NCSWMP. These Task Groups consisted of municipal officials, watershed protection committee members and consulting engineers. Effectiveness of the selected BMPs, and the success in achieving the plan’s measurable goals are reviewed annually and modified, if necessary. Local floodplain regulations can limit the extension of buildings and infrastructure into flood areas, require that such buildings are built at certain elevations, limit adverse impact to adjoining structures, and prevent the obstruction of stream channels. The early movement in floodplain regulation was initiated by the federal government’s adoption of the National Flood Insurance Program, which required localities to adopt and enforce floodplain management programs as a prerequisite to the eligibility of local property owners for flood disaster insurance and payments. Southampton’s Tidal Floodplain Overlay District establishes subdivision requirements for lot layout on the barrier beach to minimize damage from coastal storms. Setbacks are established for ocean beach water frontages in accordance with the town’s Coastal Erosion Hazards ordinance. Structures on other water frontages must be set back at least 75 feet from the upper edge of the tidal wetland. The Coastal Resilience project for New York and Connecticut is a collaborative effort led by The Nature Conservancy in partnership with the National Oceanic and Atmospheric Administration’s Coastal Services Center, the Association of State Floodplain Managers, the Columbia University Earth Institute/NASA Goddard Institute of Space Studies, Pace University’s Land Use Law Center, the University of Southern Mississippi, and the University of California at Santa Barbara.